Looking for a showstopper pesach treat? 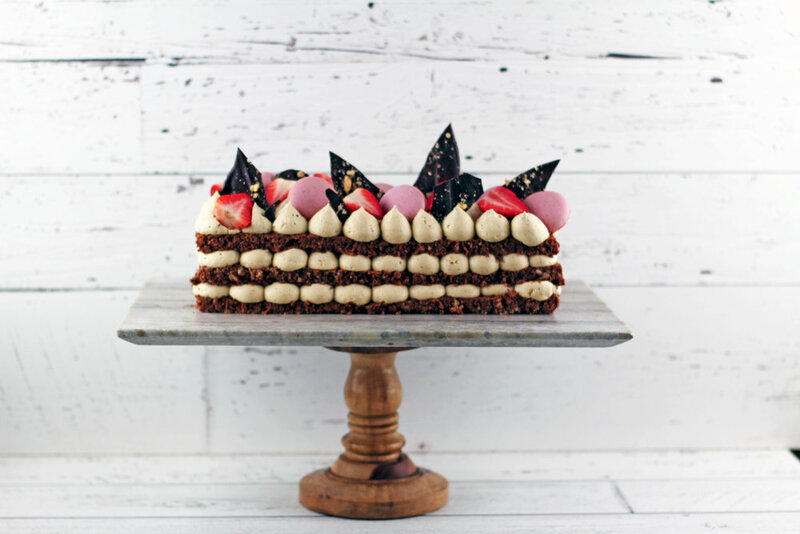 Look no further, this chocolate and praline cake is not only beautiful but also delicious. In a food processor, grind the hazelnuts with the almond flour until everything is very finely ground. Whip the egg whites until they start frothing up and gradually add the sugar. Continue whipping until the meringue holds a firm peak. Fold in the almond-hazelnut mixture and melted chocolate. Spread on a parchment lined cookie sheet. Cook for 12-15 minutes or until cooked. Be careful not to over cook, it might become brittle and dry if you do. Let cool. For this cream, I start by making a basic custard, then mixing in some whipping cream and praline paste to give it an amazing texture and taste. To make the custard, heat up the milk and vanilla in a saucepan. Mix the egg yolks, sugar and tapioca starch in a bowl. Once the milk has come to light boil, add it very slowly to the egg mixture mixing constantly. Make sure to add just a little at a time so you don't end up with scrambled egg. Return the egg-milk mixture to the saucepan but strain first. Cook over medium heat stirring constantly until thickened. Remove from heat and add butter. Spill in a plastic bag, remove the air and let set for at least 3 hours in the fridge. Whip up the whipping cream. Transfers the cooled custard in a big mixing bowl and stir it to loosen it. Add the whipped cream, praline paste (a little goes a long way) and stir until everything is combined. Cut the cake in three equal parts. Place the first piece on a serving platter and pipe the praline cream on top. Add the second piece of cake and repeat the process. Do this with the third layer too and then decorate the last layer of cream to your liking.